The Document Management System (DMS) allows users and personnel to be able to keep track of paper documents and keep visits organized and available by visit number. When scanning a document to be filed in the DMS, be sure that attached is a label with a barcode that is “unimpaired” with no major defects or abrasions. 1. At the end of a visit, collect as much paperwork for a visit as possible. 2. Arrange pages so that they are as straight as possible, not folded, etc. 3. Ensure that there is a “Case Label” – with the 2-D Bar Code in good condition – on the first page to be scanned. • That the bar code is “intact” that is hasn’t been 3-hole punched, folded over, etc. and is completely printed on the label. • That the location of the bar code is NOT right along the edge of the sheet – the scanner does have a margin around the page that it is not able to read. • Ensure that there are no other conflicting case stickers on the page. 4. Make sure the papers feed guides are as tight as possible. 5. Place the entire stack face down with the ‘top of the page down into the scanner. 6. If the CSR user is NOT logged in, click on the “next” once “csr” is highlighted. Tips: The unit will tell you if more than one page was pulled through, click abort andrescan. (Sheets with glued items will make the unit think that there is more than onepage - you must copy these pages and put a new sticker on, as copies of a sticker willnot scan properly). 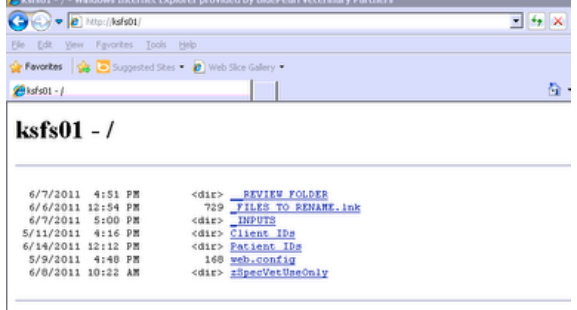 In order to view the DMS file structure, the user must type the server address into thesearch bar of a web browser. Conversely, one may also enter the IP address of the server where the scanneddocuments are located into the web browser. After typing this address into a web browser, the server name and a list of links willappear in the web browser that you are using. This method is ideal for quickly viewing scanned documents and reviewing scanneddocuments missing IDs. 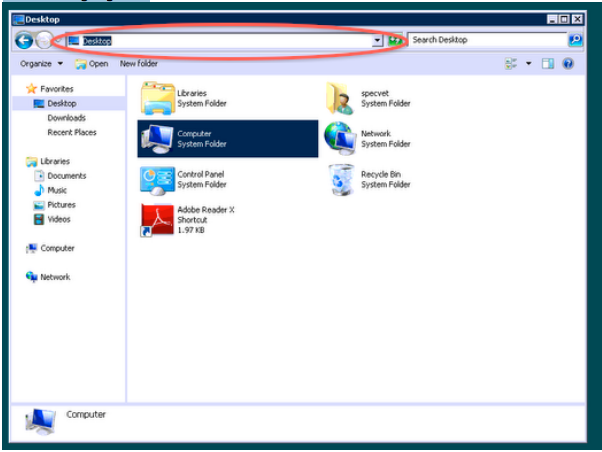 To navigate through the folders, simply click on the blue links to view folder contents.If a PDF reader such as Adobe Acrobat is installed on your computer, scanned documents will be automatically open within the web browser itself when clicked upon. To edit, rename and reprocess scanned documents imported to the Document Management System, on a windows computer open up a finder window. At the top of the window where the network path is visible, double-click until thesection is highlighted. Replace the folder path with the server name where the DMS folder structure resides. For example, if the folder structure is located on the server with the name specvet,simply type \\specvet (replace with your server name). Once at this screen, the user may move files, edit names and re-process documentsappropriately. After documents have been scanned, they get sent to the DMS. This is a back-end process with no action required from the users themselves. However, it is beneficial to know what happens to the documents after they are scanned. 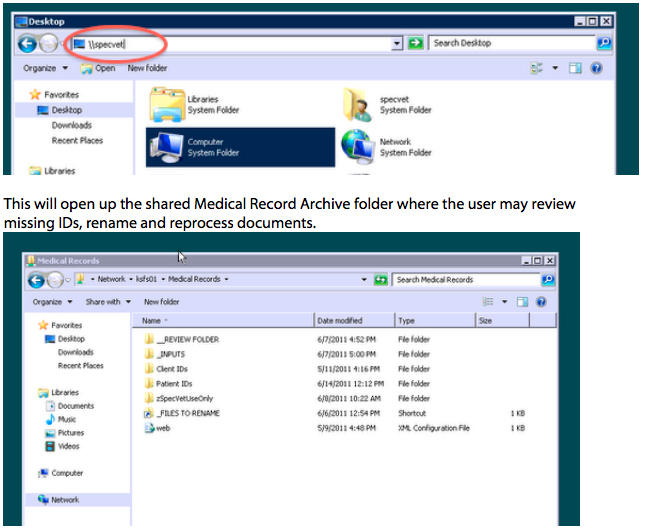 The Medical Record Archive Document Management System (MRDMS) works byhaving different folders on a server represent different types of files and activities. Scanned documents are in the "To Review & Rename" or “Missing PT IDs” folder when a 2-D barcode is not on the page, partially missing, blurred, or skewed on the page. 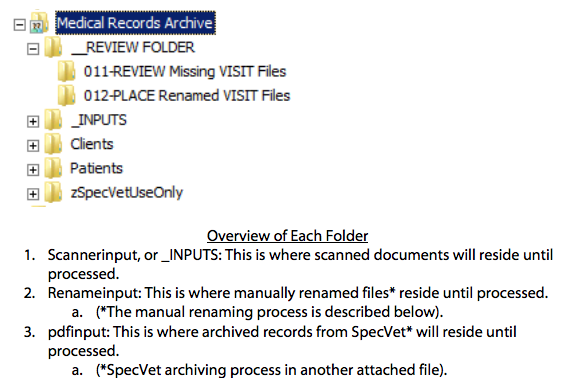 It is important to review these files on a regular basis, to minimize data loss in the patient files. There must be six digits following the P (Patient ID designation) and the V (Visit ID designation). The Patient ID and Case ID numbers must have leading zeros if either number has fewer than six digits. Once renamed, move the file to the folder "rename input". 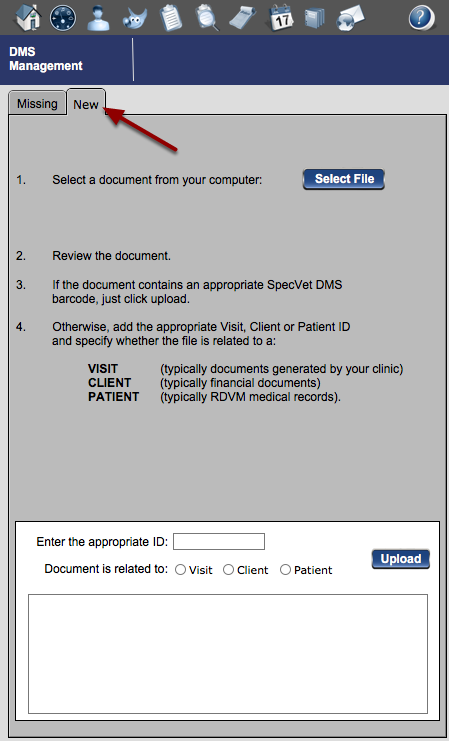 From that folder, the file will automatically transfer to the correct patient folder. Within DMS you are able to add documents from you computer. 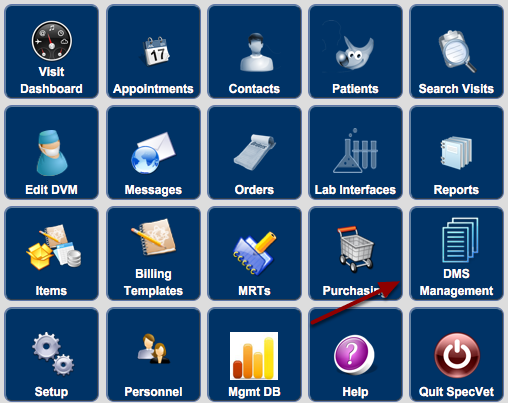 Select the "New" tab at the top of the DMS Management screen and follow the instructions listed.